A lightweight styler that protects hair from the extreme heat of styling tools, minimizing the amount of damage to hair and delivering long-lasting hold and shine. 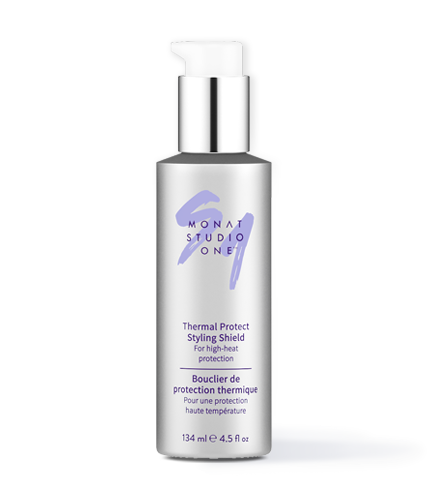 To learn more about MONAT STUDIO ONE™ Thermal Protect Styling Shield, please contact your MONAT Market Partner. 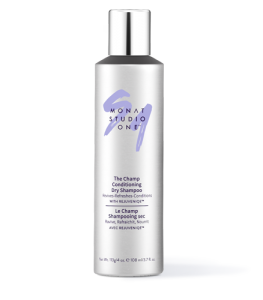 MONAT STUDIO ONE™ Thermal Protect Styling Shield provides ultimate thermal protection without the use of silicones. Formulated with MONAT’s new proprietary ingredient THERMA-GUARD 450™, MONAT STUDIO ONE™ Thermal Protect Styling Shield absorbs and dissipates heat into the hair, helping to prevent moisture loss and hair damage caused by thermal treatments and high temperature styling tools, while providing a smooth, silky feel and improved shine. Non-sticky, non-tacky texture allows for a clean release from hands and styling tools.